NOTICE: Road Use Local Law and Permits (see this PDF). The permits can be obtained at the Town Clerk's Office or printed off from the website for a per job or 1 yr. permit. Permit will need to be signed by Vince Witkowski, Highway Superintendent (607) 656.7969 option 4 or (cell) 244.1573; fee paid at the Town Clerk's Office. 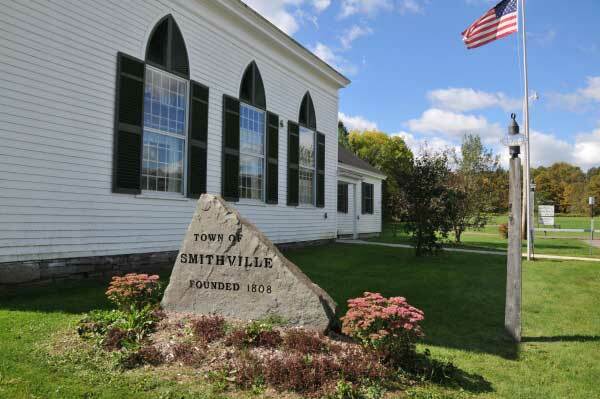 In preparation for updating Town of Smithville properties, Town Assessor Jeff Lowe, and other Town Officials may be in your area taking photos of properties. Before you build or develop your property, please read over/answer questions on this questionnaire to see if your project needs to be reviewed by the Town Planning Board in a *Site Plan Review. * Even though your project may or may not need a Chenango County Building permit, it may need a Town of Smithville Site Plan Review. If you have questions, please contact a member of the Planning Board, listed on the Planning Board page. The Town Clerk's Office is now selling NYSDEC sporting licenses! Monday, Tuesday, Thursday 9 am-3 pm; Closed Monday legal Holidays; Friday by chance 9 am-noon.